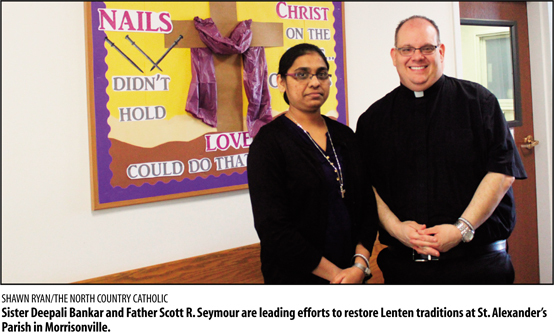 MORRISONVILLE – This Lenten season, St. Alexander’s Parish is renewing a tradition which Father Scott Seymour brought to the parish nearly a decade ago after experiencing it in other parishes where he had served; the Bread and Soup dinner. The tradition, which is shared in numerous parishes around the Diocese, is a time for parishioners to come together for fellowship, Mass, good food and prayer, and to reflect on the deeper meaning of Lent. The Wednesday dinners, which started March 20, feature a keynote speaker each week, a pastor who will bring his own message to the Mass and the following period of preaching. The gathering on March 20 featured retired Msgr. Leeward J. Poissant from Plattsburgh; March 27 will feature Bishop Terry R. LaValley; and April 3 will feature Father John R. Yankovich. Father Seymour noted the events are open to and draw all ages. “It’s inter-generational. You’ll get young and old and everything in between,” he said. While the meal itself might be simple, it is far from ordinary. Parishioners from the parish’s Disciples in Mission group provide the meal and serve from 10 to 20 different crocks of soup, along with artisan bread, to the 15 to 50 people who come for the meal. The Disciples in Mission Group, which predates Father Seymour’s time at St. Alexander’s, is a Bible study group organized by Sister Deepali Bankar, of the Sisters of the Cross of Chavanod. “They focus on the mystery of God. It speaks about the Scriptures and the mystery of God,” said Sister Deepali of the various weekly study topics the group undertakes, which are based on the Mysteries of God teachings by Bishop Robert Barron. But Bread and Soup nights are not the only Lenten tradition practiced at St. Alexander’s. All parishioners are encouraged in the Lenten tradition to eat more simple family meals throughout Lent, and are sent home with Alms Boxes. The money they save by eating more simply is put in the Alms Boxes, which then gets donated on Holy Thursday to supply one of the parish’s main missions, the weekly soup kitchen in Treadwells Mills. “We use the money that they save to feed other people,” explains Father Seymour, adding that the soup kitchen typically provides soup, a full meal and dessert for 90 to 100 North Country residents every Thursday night. Depending on the available food for the week, some nights people are even given food to bring home to help get them through their week. With Lent now well underway, St. Alexander’s is gearing up for both a very prayerful and eventful spring and summer season yet to come.